"Calico Bass" redirects here. For the marine fish, see Paralabrax clathratus. Crappies (/ˈkrɒpi, ˈkræpi/) are a genus, Pomoxis, of North American fresh water fish in the sunfish family Centrarchidae. Both species in this genus are popular pan fish. The genus name Pomoxis derives from the Greek πώμα (cover, plug, operculum) and οξύς (sharp). 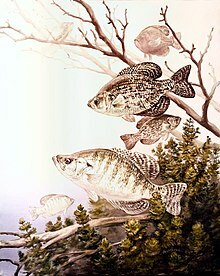 The common name (also spelled croppie or crappé), derives from the Canadian French crapet, which refers to many different fishes of the sunfish family. Other names for crappie are papermouths, strawberry bass, speckled bass or specks (especially in Michigan), speckled perch, white perch, crappie bass, calico bass, (throughout the Middle Atlantic states, and New England), sac-a-lait (in southern Louisiana, lit. "milk bag", an alteration by folk etymology from Choctaw sakli) and Oswego bass. Both species of crappie as adults feed predominantly on smaller fish species, including the young of their own predators (which include the northern pike, muskellunge, and walleye). They have diverse diets, however, including zooplankton, insects, and crustaceans. By day, crappie tend to be less active and will concentrate around weed beds or submerged objects, such as logs and boulders. They feed during dawn and dusk, by moving into open water or approaching the shore. The Pomoxis species are highly regarded pan fish and are often considered to be among the best-tasting freshwater fish. Because of their diverse diets, crappie may be caught in many ways, including casting light jigs, trolling with minnows or artificial lures, using small spinnerbaits, or using bobbers. Crappies are also popular with ice-anglers, as they are active in winter. 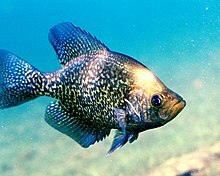 The current all-tackle fishing world record for a black crappie is 2.25 kg (5.0 lb) and for a white crappie is 2.35 kg (5.2 lb). Angling for crappie is popular throughout much of North America. Methods vary, but among the most popular is called "spider rigging", a method characterized by a fisherman in a boat with many long fishing rods pointing away from the angler at various angles like spokes from a wheel. (Spider rigging is not permitted on some waters. In Minnesota, for example, a fisherman may use only one rod during the open water season.) Anglers who employ the spider rigging method may choose from among many popular baits. Some of the most popular are plastic jigs with lead jig heads, crankbaits or live minnows. Many anglers also chum or dump live bait into the water to attract the fish to bite their bait. Crappies are also regularly targeted and caught during the spawning period by fly fishermen, and can be taken from frozen ponds and lakes in winter by ice fishing. Before state fisheries departments began to implement more restrictive, conservation-minded regulations, a great number of crappies, especially in the Mississippi River states, were harvested commercially in the 19th and early 20th centuries. At one point the annual crappie catch sold at fish markets in the United States was reported to be approximately three million pounds. A commercial fishery for crappies existed at Reelfoot Lake in Tennessee until 2003. It was one of the few commercial fisheries for crappies in recent decades. ^ "Crappie". American Heritage Dictionary (4th ed.). Retrieved 29 June 2006. ^ "Crappie". Merriam-Webster Online Dictionary. Retrieved 29 June 2006. ^ "Louisiana Fisheries - Fact Sheets". www.seagrantfish.lsu.edu. Retrieved 6 March 2019. ^ Schultz, Ken. Ken Schultz's Field Guide to Freshwater Fish. Hoboken: John Wiley & Sons, 2010. ^ Froese, Rainer, and Daniel Pauly, eds. (2013). Species of Pomoxis in FishBase. February 2013 version. ^ Froese, Rainer and Pauly, Daniel, eds. (2006). "Pomoxis annularis" in FishBase. March 2006 version. ^ Froese, Rainer and Pauly, Daniel, eds. (2006). "Pomoxis nigromaculatus" in FishBase. March 2006 version. ^ a b "Comprehensive Report Species – Pomoxis annularis". NatureServe Explorer. Retrieved 29 June 2006. ^ a b "Comprehensive Report Species – Pomoxis nigromaculatus". NatureServe Explorer. Retrieved 29 June 2006. ^ "Black Crappie". Florida Museum of Natural History Ichthyology Department. Retrieved 29 June 2006. ^ "Super Crappie Systems". In-Fisherman. Archived from the original on 22 December 2006. Retrieved 23 February 2007. ^ "Fisheries." The New International Encyclopedia. 2nd ed. New York: Dodd, Mead and Co., 1930. Ellis, Jack (1993). The Sunfishes-A Fly Fishing Journey of Discovery. Bennington, VT: Abenaki Publishers, Inc. ISBN 0-936644-17-6. Rice, F. Philip (1964). America's Favorite Fishing: A Complete Guide to Angling for Panfish. New York: Harper Row. Rice, F. Philip (1984). Panfishing. New York: Stackpole Books. ISBN 0-943822-25-4. Malo, John (1981). Fly-Fishing for Panfish. Minneapolis, Minnesota: Dillon Press Inc. ISBN 0-87518-208-9. Nelson, Gary; Martin, Richard; Sutton, Keith (1991). Panfishing. Minneapolis, MN: North American Fishing Club. ISBN 0-914697-37-4. Wikimedia Commons has media related to Pomoxis.